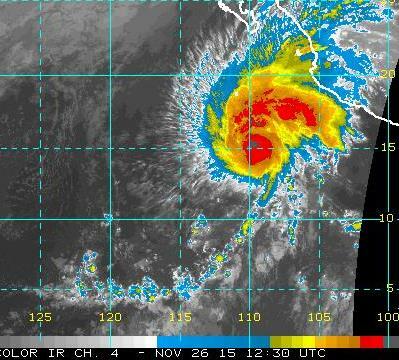 The NHC has rated Sandra as a Category 4 hurricane early this morning. 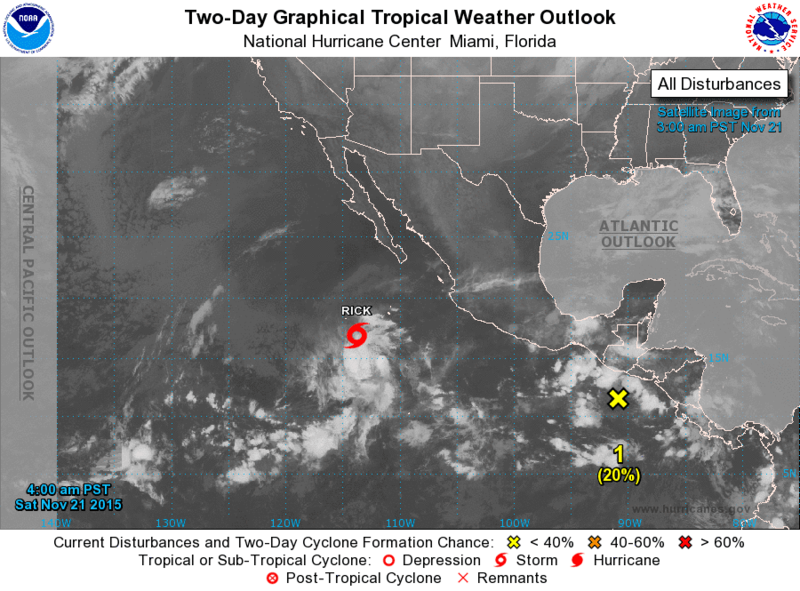 This is the nineth major hurricane this season to develop in the eastern Pacific - which is a record number according to a message yesterday from NHC. 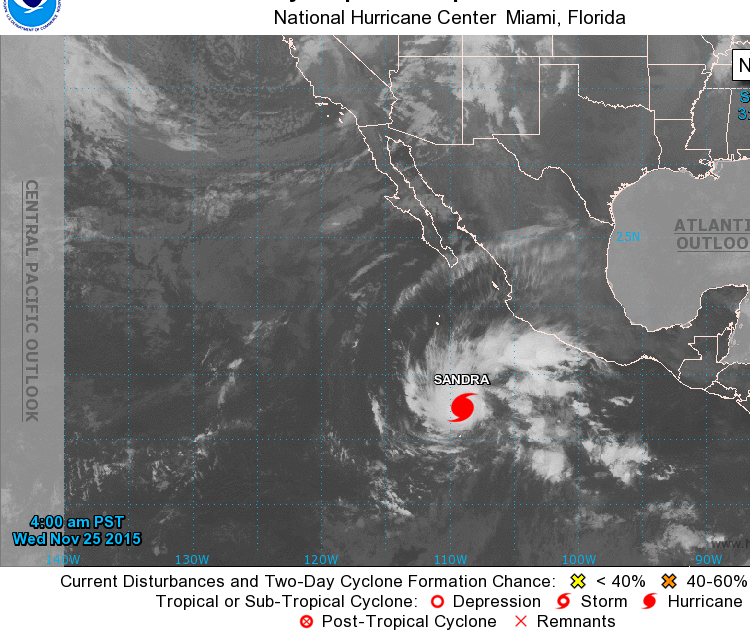 The storm will weaken, according to the NHC forecasts, as it moves past southern Baja and into Mexico this weekend, with its main threat being heavy rains and flooding. Although it was supposed to be "Partly Sunny" today, it has actually remained heavily overcast and been a rather dreary day. Above and below are webcam views of the Catalinas from campus this morning and again about 30 minutes ago. 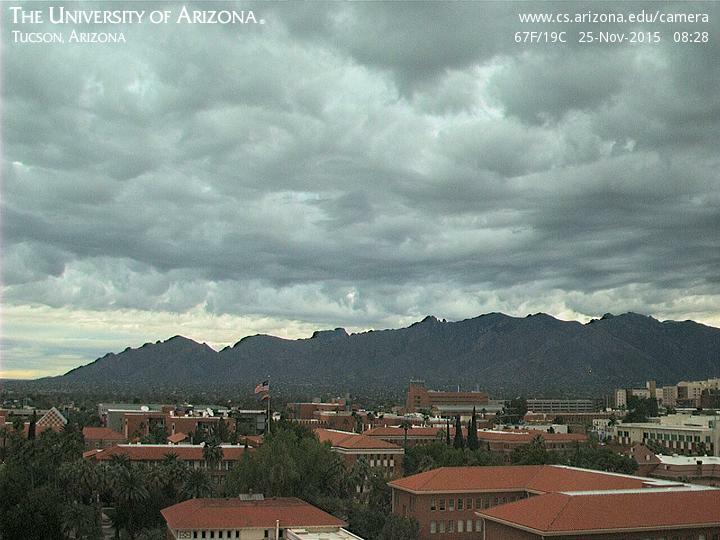 The solar radiation data from Atmo (second below) indicate that it has indeed been a very cloudy day. Very Mild Morning - 25 November 2015 - And Etc. After yesterday's chilly morning low here of 37 F (49 F at TUS), it is a very mild morning today. Current temperature here at 6 am is 52 F and low was only 46 F (airport numbers 62 F and 57 F). Shown above is a 6:00 am MST surface plot from MesoWest (Univ. of Utah) and shown below is the WRF-NAM surface forecast valid at the same time from the 12 UTC forecast run yesterday morning. Appears to have been a pretty good 24-hour hour forecast. The 06 UTC WRF-NAM forecast from today indicates gusty winds for southeast Arizona and very strong winds up in the northeast third of the state (forecast below is valid at 1:00 pm this afternoon). Tomorrow the forecast indicates that strongest winds shift eastward into Santa Cruz and Cochise Counties and new Mexico. Hurricane Sandra (above at 5:00 am MST) is forecast by the NHC (below) to become a major hurricane, before turning northeastward and heading into Mexico. The main precipitation over the weekend (above is 06 UTC WRF-GFS forecast of accumulated precipitation through 5:00 PM next Sunday) is forecast to occur over the mountain ranges of the Inter-mountain West. Hurricane Sandra produces major rains over western Mexico, and the moisture plume from Sandra contributes to a very major rain event over the Southern Plains. Flash Flood watches are already in effect for parts of Oklahoma and Texas for Friday and Saturday. Best of the Holiday Weekend to all! First, the gusty winds forecast over the weekend were very sporadic, especially on Saturday - there were some gusts in the 20 to 25 mph range but these were not strong enough to have much impact on the bicycle races. Winds were stronger on Sunday morning, with gusts from the east up to 32 mph at TUS. Morning lows here were in 30s F but above freezing. Russ Scott has sent along some interesting data from his flux towers over near Tombstone. The sites of interest are those in green, and Charleston (CM), along the San Pedro is at 1200 m, Lucky Hills (LH) at 1370, and Kendall (KN) is at 1531 m. The sites are about 12 km apart. "Your Madweather post this morning got me wondering again about why some mornings have the valley bottomlands that are so much colder than the higher locations in the valleys. Is it local radiational cooling, cold air drainage, or even evaporative cooling (from moisture riparian-esque vegetation)? 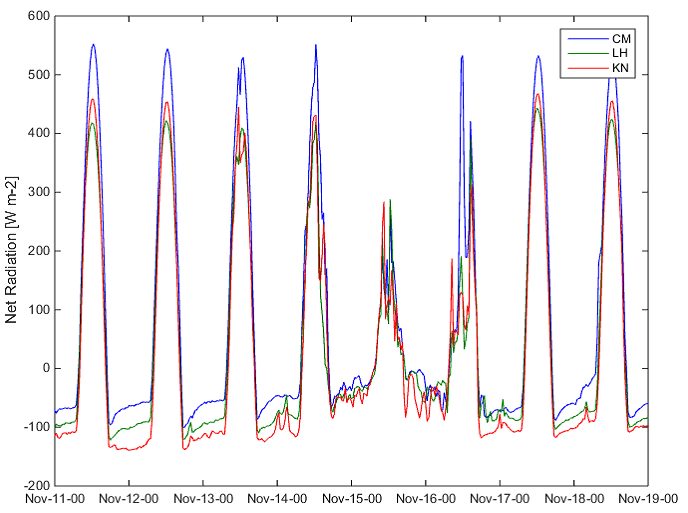 Here are some plots from the last seven days in the San Pedro Valley from my three metflux towers." The temperature plots above from the 12th through the 14th of November indicate that the site near the San Pedro was dramatically colder than the other two sites to the east. - the morning lows being 10 C or more colder. 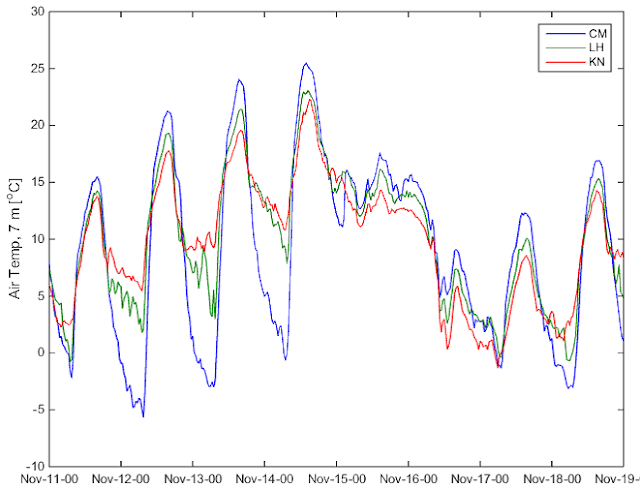 However, the radiative flux data (above) show that the nighttime, long-wave cooling was was similar, and also smallest at the CM (coldest) site. 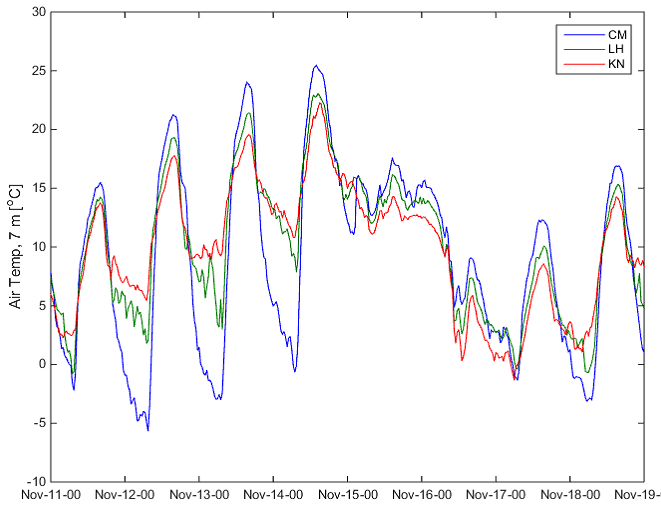 The wind speeds, however, (below) show that the CM site is less windy than the other two sites, especially during the night. First - low-level radiational cooling at night is probably more effective in producing a cold and stable and very shallow layer just above the surface at CM, particularly because of the nearly calm winds and less vertical mixing than at the other two sites. Second - there is probably cold drainage occurring within the very shallow, cold and stable layer from the nearby, slightly higher and more barren (lower heat capacity surfaces) areas, both to the east and west of the San Pedro. Other thoughts and/or comments most welcome. This morning's 12 UTC upper-air data from TWC (above) show 15 to 20 kts winds just above the surface inversion. These winds should mix down quickly to the surface as the sun eats away the inversion. The WRF-NAM forecast below is for 10-m winds valid at 11:00 am MST this morning. The winds may be a bit of a hindrance for Tucson's big El Tour de Tucson bicycle races today. Northern Illinois and southern Wisconsin are being hit by a pre-Thanksgiving snow storm today - surface plot above is for 1410 UTC this morning and it shows numerous reports of moderate to heavy snowfall. Expect serious flight delays today in and out of Chicago. 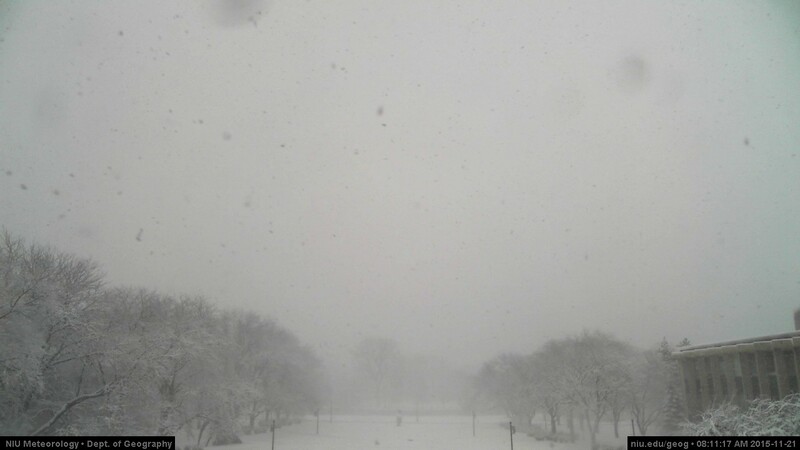 Webcam shot below is from the campus of Northern Illinois University in DeKalb, Illinois. Further west, morning temperatures have dropped to -10 to -20 F in the northeastern part of Wyoming. 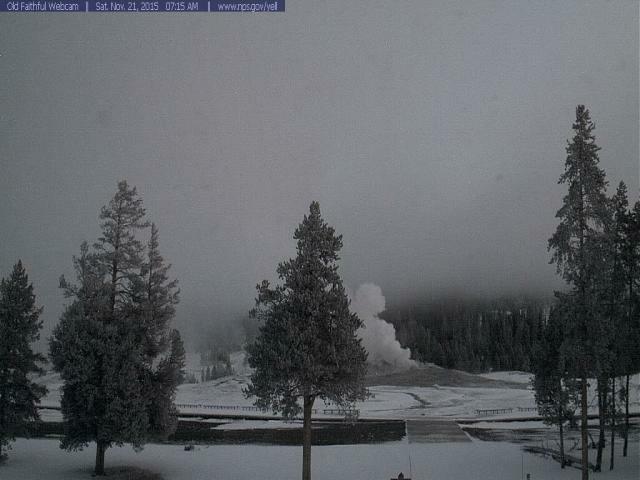 Webcam shot below shows Old Faithful geyser, but no spectators out and about yet. This from Jack Hales webpage - link to the right. At low-latitudes, Tropical Storm Rick (above) is a very marginal storm; however, the trailing disturbance near Central America (yellow X) is expected to become Tropical Storm Sandra by early next week. Currnt NHC forecast for Rick is shown below. Low temperature here stayed above freezing (35 F) this morning for first time since the 16th. The WRF-NAM forecasts from Atmo continue to indicate east winds coming in from southern New Mexico tomorrow and continuing through Sunday morning. The forecast above is from the 06 UTC run this morning and indicates strong winds at 10:00 am MST, Sunday morning. The winds will cause many locations to to have much warmer morning temperatures - the surface plot forecast (below) is valid at 7:00 am Sunday morning. Note that even though the airport was about 10 F warmer this morning, yesterday's WRF-NAM forecast was about 10 F too warm (mid-50s vs observed mid-40s), so it will be interesting to watch the temperatures over the weekend. First a bit re low temperatures: here at house the lows last three mornings have been 28 F Tuesday, 28 F Wednesday, and 30 F today (light frost all three mornings). 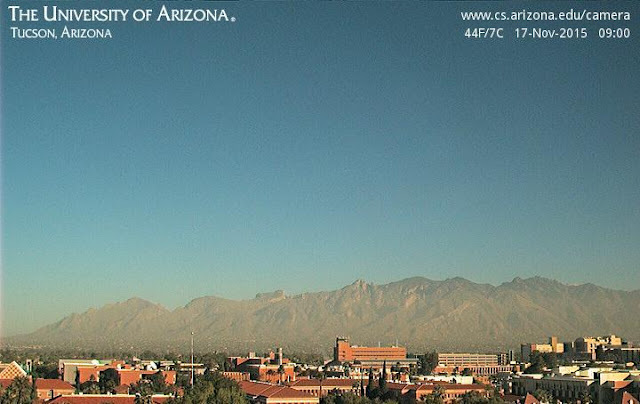 This morning is a classic example of warm temperatures in the mountains and radiational cold at lower elevations, Low so far at airport (as of 7:00 am MST) has been 40F, Low here 30 F, Sasabe RAWS 29 F, and Empire RAWS 31F. In contrast the lows at Mt. Hopkins RAWS have been only 49 F, Rincon RAWS 46 F, and Sollers RAWS (Mt. 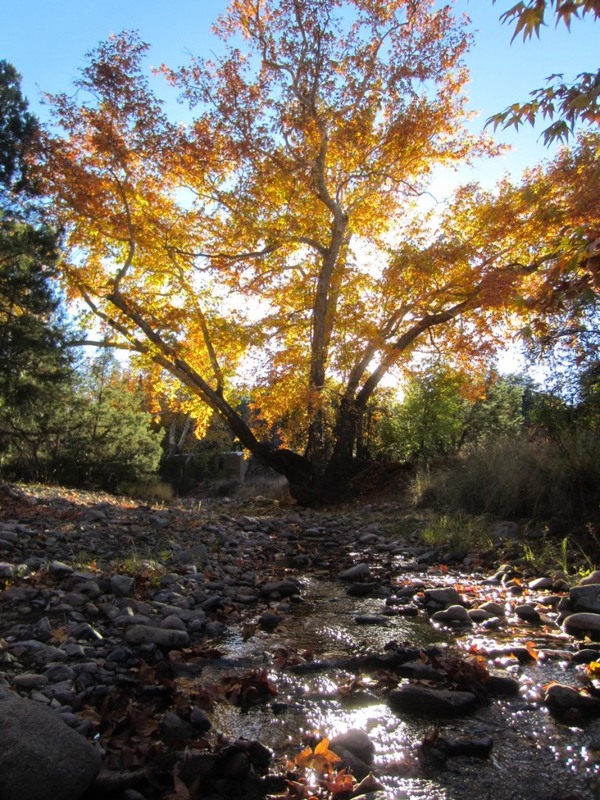 Lemmon) 47 F. So below freezing at many low elevation sites and 20 F warmer up in the mountains. A backdoor front from the southern, High Plains will bring easterly winds, particularly on Saturday, which will complicate the low temperatures situation considerably next several mornings. Forecast above is from the 06 UTC run of the WRF-NAM at Atmo and is valid at noon on Saturday. The NHC is issuing advisories on TD Twenty-One E (above), which is currently located well south of the mouth of the GoC. The current forecast (below) indicates that the TD will become TS Rick. 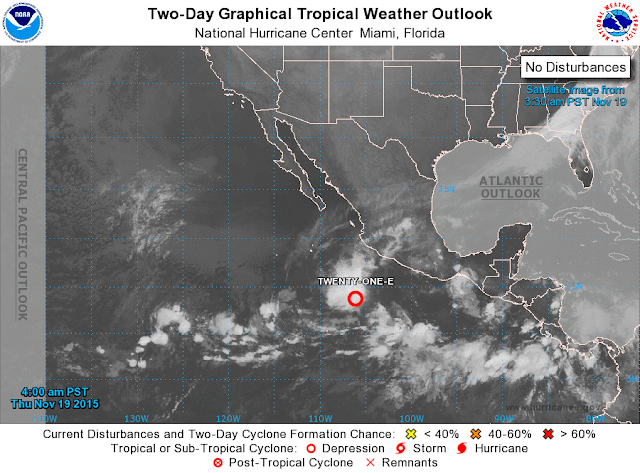 This system may bring heavy rains to parts of Baja and northwestern Mexico. The forecast above is from the 00 UTC run of the WRF-GFS at Atmo and shows the forecast for total precipitation on the 5.4 km grid through 5:00 pm on Thanksgiving. The model currently forecasts little over much of the Southwest through the Holiday, but with significant rains to our south in Mexico and heavy mountain snows in parts of California, Utah and Colorado - of course this forecast goes way out though 7-days and is probably at best a very broad brush picture. 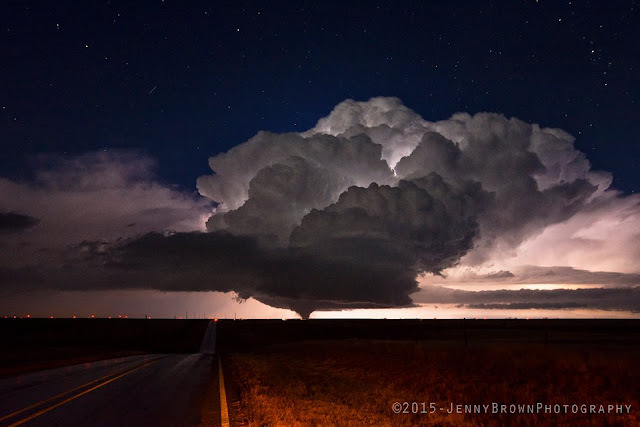 Mike Leuthold forwarded photo above of tornado south of Pampa, Texas, a bit before 7:00 pm CST last evening. Air was quite dirty this morning, probably from suspended dust. The Rincons were almost totally obscured from here around 8:30 am MST. 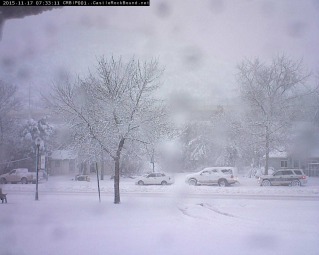 Some webcam photos from this morning are below. Low temperature here this morning was not as cold as I thought it would be - perhaps some light breezes before sunrise? - and was only down to 30 F. This was the sixth freeze so far here in November. 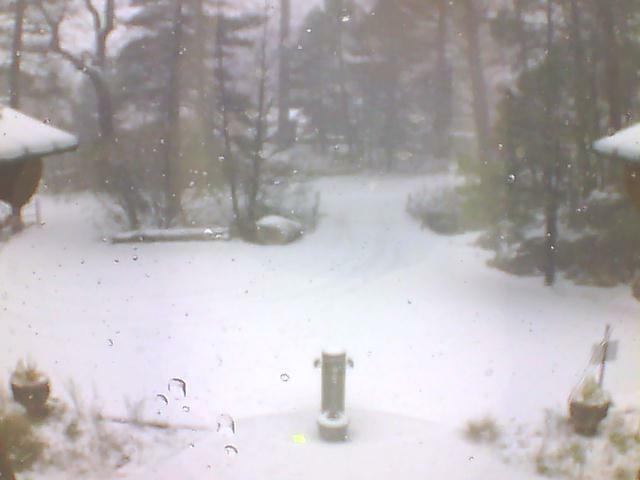 Above is general Store webcam shot this morning in Summerhaven - hard to tell how much snow they might have had up there. 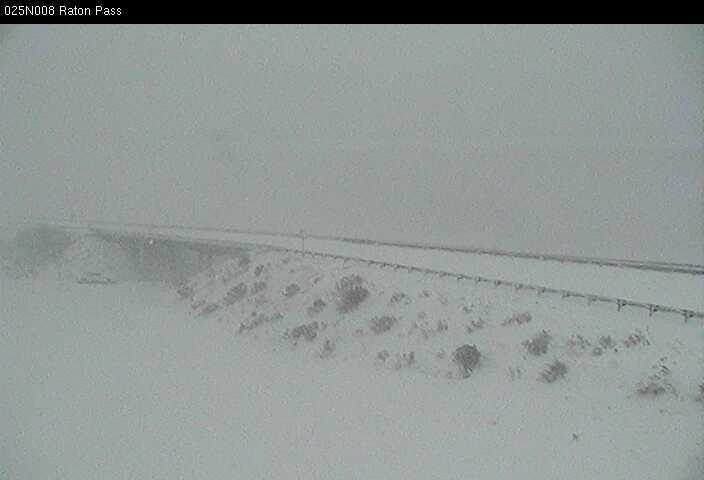 I-25 south from Denver has had some nasty driving conditions this morning - just above is Castle Rock on Palmer Ridge, and below is I-25 at Raton Pass. 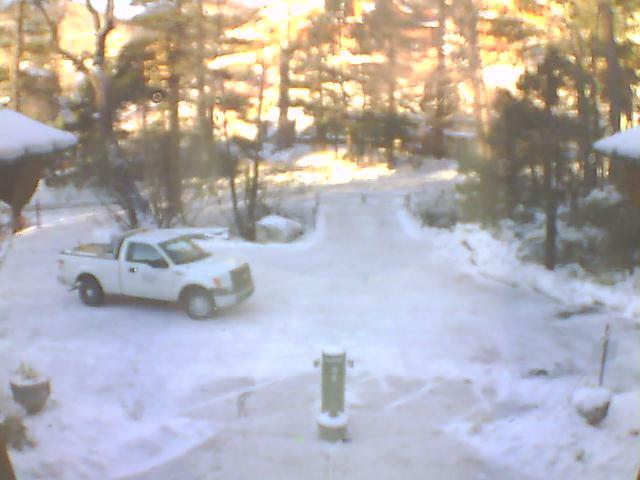 Above image is from the web cam at the general store in Summerhaven on Mt. 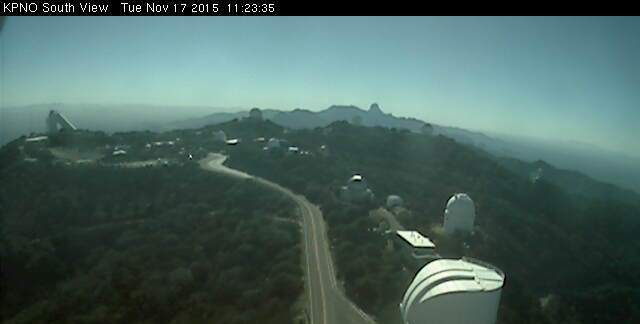 Lemmon - was at mid-morning about the time that this cam went offline. Two images from Mike Leuthold taken near his place in Paradise. 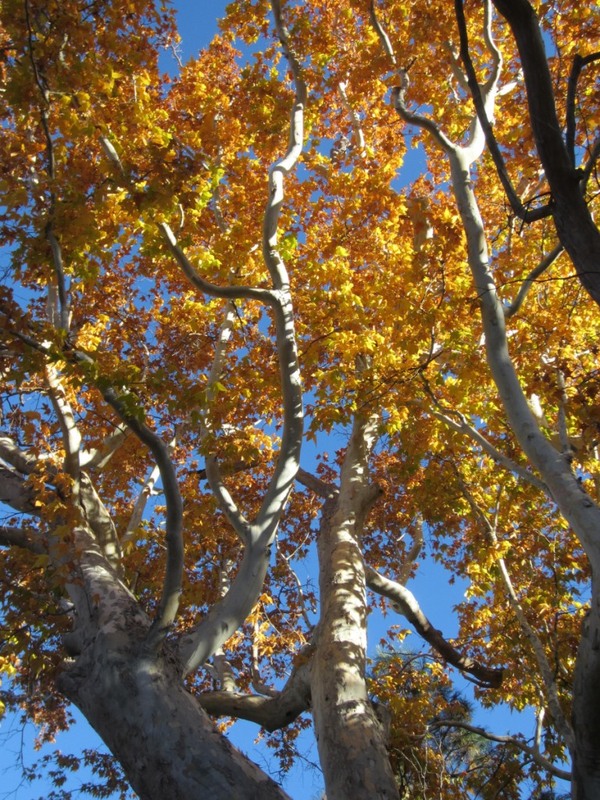 Subject is a beautiful Arizona Sycamore. The current NWS weather story now shows a map that delineates the actual areas of the county that are under the current freeze watch - this is an improvement re earlier today. But, when one examines the small-scale, grid forecasts the points within this morning's broad-brush watch map still show that they have a freeze watch in effect (as per, click on the airport grid). So, an improvement but still an inconsistent set of products and maps. AM Showers Again - Freeze Watch For? Early morning showers again, mostly across northern portions of the metro area. 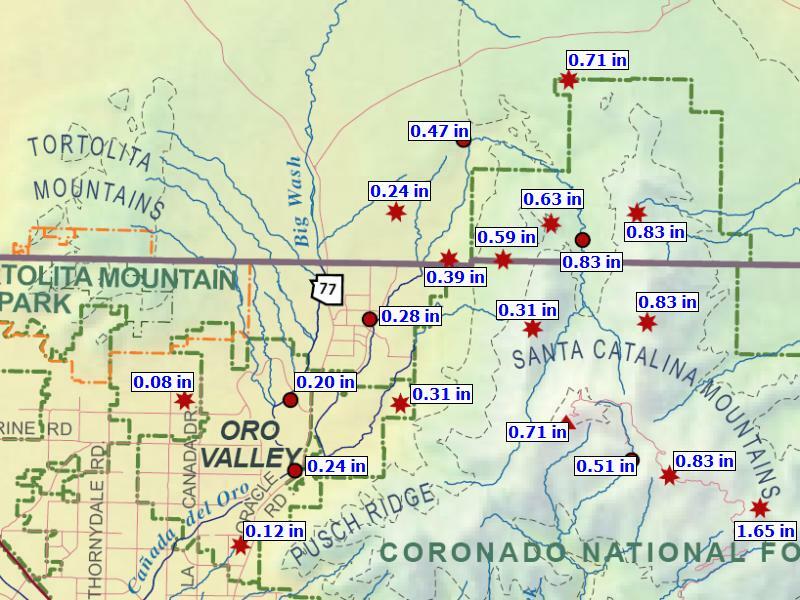 This event has been widespread across eastern Pima County but ALERT network shows that amounts were mostly around 0.15" or less, except up in the Catalinas. There has been some thunderstorm activity, as indicated by the 24-hour CG flash density plot below valid through 6:15 am MST this morning (from weather.graphics and Vaisala). 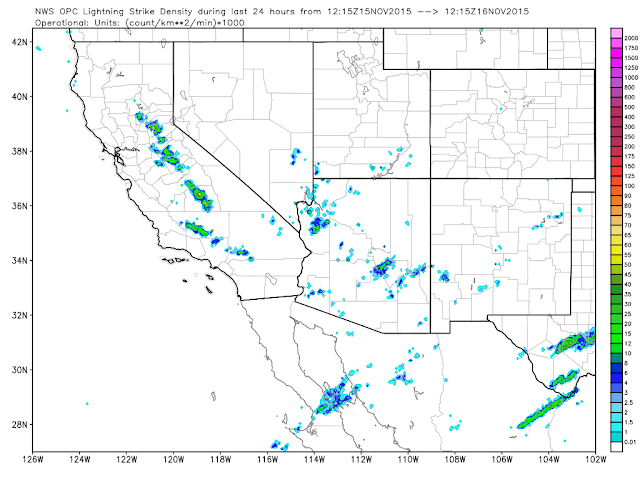 Thunderstorms avoided most of Pima and Santa Cruz Counties. Here at the house there were three periods of light showers yesterday, ending around 3:00 pm - total rain for yesterday was 0.14". This morning's showers have added 0.04" at this time. The Catalina sector of the ALERT data (second below - for 24-hours ending at 6:00 am), indicates another substantial event for the mountains. The 06 UTC run of the WRF-NAM model at Atmo indicated showers ending mid-day to early afternoon, as the cold trough sweeps by. I will gripe again here about the imprecise character of some of the graphics used by the NWS. First, I should say that freezes are important to a number of folks locally - whether they are landscapers, gardeners, citrus growers, or even homeless and on the streets (the NWS forecasts trigger whether or not many shelters will open on cold nights). The current NWS graphic above indicates a freeze watch across the entire metro area, and the early am forecast grid for TUS (the airport grid box) shown below indicates that the freeze watch is valid at the airport. TO NOT EXTEND CURRENT FREEZE WATCH OR CONVERT TO A WARNING. WILL LET DAY SHIFT EVALUATE FURTHER. The 3:33 am forecast discussion above seems to indicate that the freeze watch has not been continued due to uncertainties. 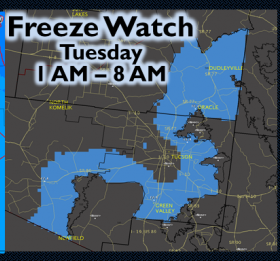 However, the 5:00 am MST text for the freeze watch (below) indicates that the watch continues, but that much of the metro area is not included. I can not find any graphics that show the actual, current delineations of the freeze watch area. 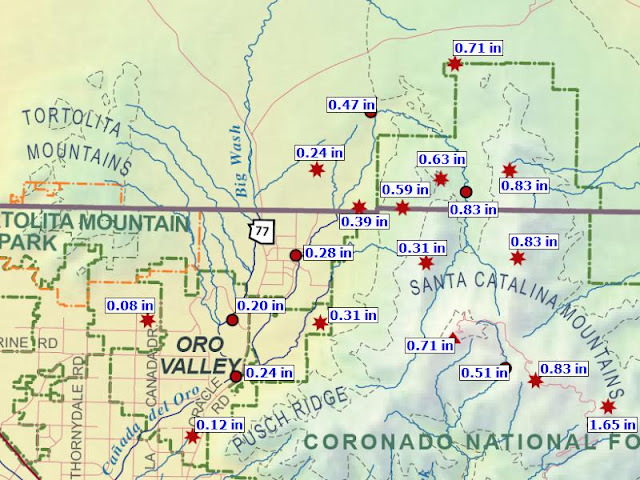 Additionally, the statement emphasizes that the Catalina foothills (generally north of the Rillito Wash extending up to Federal lands) are in the watch area. But, this zone is known as a "banana belt" for its warmer morning temperatures during the winter. So, to me, the situation seems generally confusing, aggravated by imprecise graphics. If you're concerned about low temperatures the next couple of mornings, you have to rely mainly upon local experience during similar events. Here at our location, I know that it will be below freezing the next couple of mornings, probably well below, and if I had bougainvillea blooming in the yard, I'd take action to protect them. Finally, graphic at bottom is from the 06 UTC forecast from the WRF-NAM model and shows 2-m temperatures forecast for 7:00 am tomorrow morning. The model has picked up on both the Rillito cold zone, as well the foothills banana belt. INCLUDED IN THE FREEZE WATCH AT THIS TIME. We have been away at Santa Rita Abbey (about 5 miles north-northwest of the highway intersection that is Sonoita) Friday evening and yesterday. 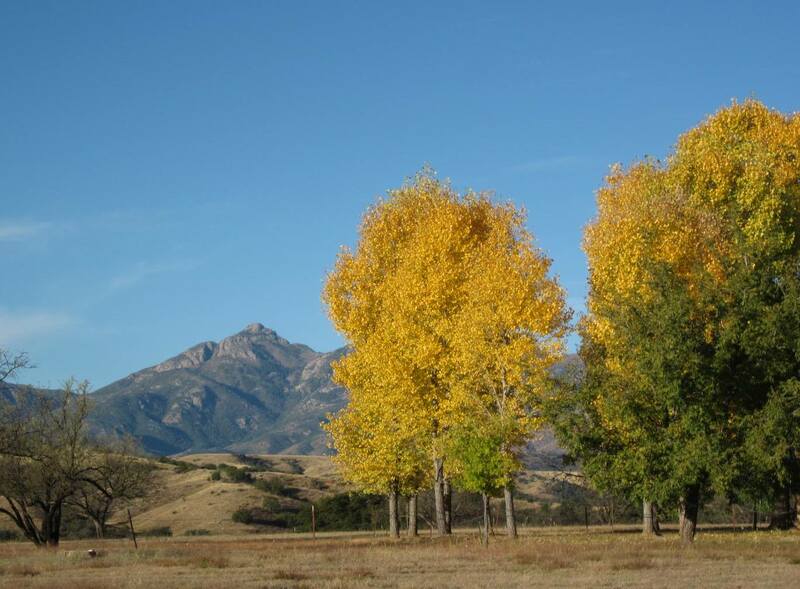 The hills are in their winter browns with patches of green trees, but the cottonwoods at the Abbey were ablaze yesterday. Photo above is looking toward Mt. Wrightson. Watching the sky to the south yesterday, I noted cumulus appearing along the horizon around 10:00 am MST, and by 3:00 pm they had inched northward and extended almost to the Tucson metro area. The 10 UTC MIMIC blended PW analysis this morning (above from CIMSS at Univ. of Wisconsin) indicates a narrow atmospheric river extending northward to the northern California coast. Of more interest to us is the northward extent of subtropical moisture that now reaches into southern Arizona, much as the models forecast Friday morning. Light rain showers are now occurring over much of southern Arizona - as per 5:00 am composite radar chart (above) from the NWS. Thunderstorms have so far remained along and south of 30 degrees north - as per plot of detected CG flashes during past 12-hours (below from Atmo and Vaisala). The 06 UTC run of the WRF-NAM model at Atmo (second below) now forecasts a widespread precipitation event that is heaviest from the Tucson metro area northward and northeastward, with highest accumulations in the mountains. This forecast is very much different than the one I showed on Friday morning - the biggest difference being the large decrease in amounts forecast southeast of the Tucson area. Current NWS POPs forecasts for various grid points go like: TUS 60% (today)/30% (tonight); Mt. 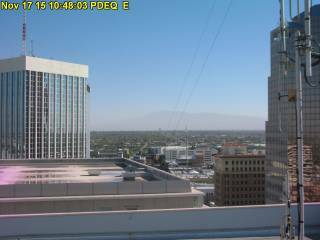 Lemmon 90%/60%; most of southeast Arizona east of Tucson 70-80%/40% including both the higher and lower elevations at spots like Mt. Hopkins, Art Douglas' place, Portal, Chiricahua National Monument, and Guthrie. Quick update on early morning showers: between 5:00 and 7:00 am this morning 80% of the ALERT stations in eastern Pima County recorded 0.04" or more rainfall (Mt. 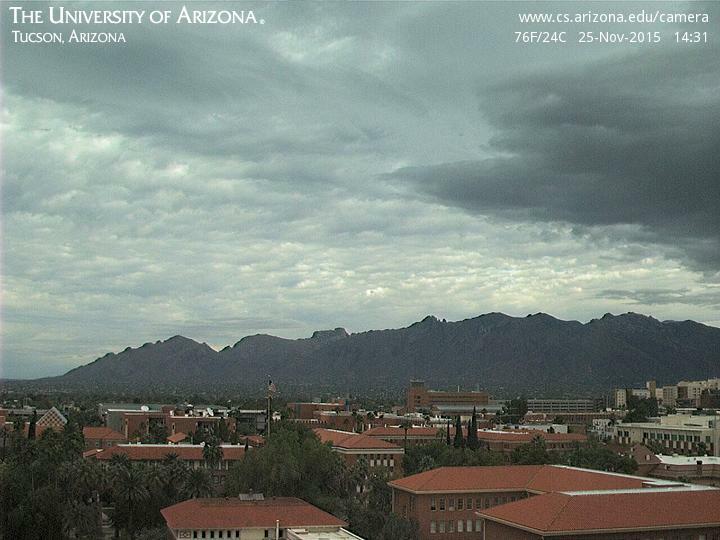 Lemmon had 0.28" in those two hours), coverage of measurable amounts likely near 100%. Here at house 0.04", DM 0.04", Atmo 0.05", and TUS 0.06". So a widespread start of the precipitation this morning. As the 500 mb short wave currently along the West Coast digs toward Arizona, temperatures at that level decrease markedly. The 500 mb forecast (above from the 06 UTC WRF-NAM valid at 6:00 pm tomorrow evening) shows temperatures dropping to around -27 C. Main impact of this cold air aloft will be several cold mornings next week. The WRF-NAM forecast of surface conditions over eastern Pima County (below) is valid at 7:00 am MST on Tuesday morning the 17th - the blue tones are near and below freezing. 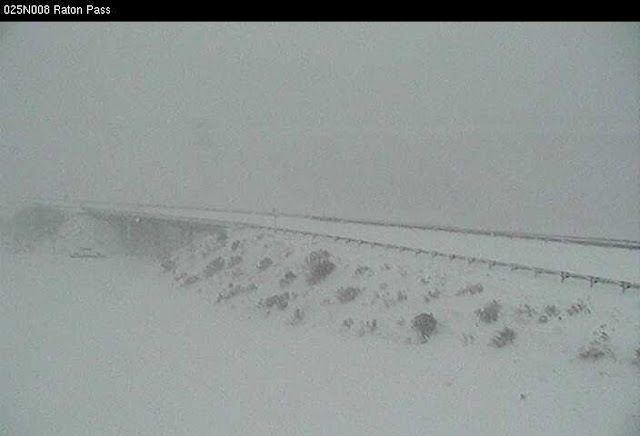 It appears that this forecast is picking up, albeit weakly, the cold zone along the Rillito Wash. Note that, while there have been no freeze alerts yet for the metro area, here at the house we have already had four November mornings with lows of 32 F and colder, with frost on two mornings. Tuesday and Wednesday mornings this week should be down into the low to middle 20s F here. Some Rain Saturday Night And Sunday?